I mentioned last week, in Happy Samhain, that I have been working quite a bit with the elements over the past year. Not for the first time, in fact the third, but I seem to go deeper and take longer each time. On this occasion I stayed with each element, exploring through meditation, ritual, appropriate outdoor activities and music, for around 6-8 weeks, and then mostly had a quick end when I realised I was going too far out of balance. Earth I gradually became ‘stuck in the mud’ and lethargic, not getting anything done. I also had molehills appear all over the place, in the middle of winter when I wasn’t otherwise digging the ground, forcing me to connect directly with the soil more than just walking. Water saw me crying a lot, and it raining a lot. The washing machine broke two pumps and flooded the kitchen on more than one occasion. My daughter suddenly decided she was ready to visit the swimming pool at last, enabling me to go too. Air saw strong winds and many ideas, if often impractical or challenging intellectually. The fence blew down. Fire saw drought and moorland fires, but I was being scared of it and in hindsight didn’t really open up to its teachings. I ask myself, was I just more aware of each of these things because I am thinking about their element? No, I haven’t mentioned all of the occurrences, and there were way too many coincidences for it to simply be awareness, but that is part of being with the element too. I can say that within the year just gone they were the most extreme periods for each type of weather. But as I said, I didn’t really do Fire. I remember feeling relieved that I got through unscathed, no burning the house down or major temper outbursts, because I was deliberately keeping it in balance with the other elements. However, I am now realising that fire is determined to teach me. The fire is relit within me and new projects are taking off – but I need to direct my energies better. In two weeks I have managed to burn an oven mitt, a pillowcase, a wooden spatula, and yesterday a pan that boiled dry. Finally I recognise what I am being shown. So having got the message at last, now I need to sort it out. Make my connection to Fire in a positive way, and use it to not only be creative but follow things through. To take action where action is needed. Meanwhile, the totally blackened pan won’t scrub clean, so I look online for ideas. Vinegar and baking soda. Bio washing liquid. Well each did get it a bit better, but not so you’d notice if you hadn’t seen how it started out. Rhubarb, I thought. Was there any left? Despite the recent frosts there were four thin stems still with colour on them. I picked two, and boiled them in the pan. A bit of scrubbing, mainly with the burnt spatula, and I can see silver again. Fighting fire with fire. We have a rather slow building project going on here, turning our L-shaped house into a square. This summer’s project has been to make a window in the outside wall of the bathroom… For the past 3-4 years the room has been a ‘black hole’, having no natural light or ventilation. However, what I never anticipated was what a great meditation and journeying space a totally black room could create. In a reversal of what some people do, lighting candles around the bath, I found I could reach the pull cord to turn the light off and have total darkness – while being immersed in my favourite element, water. Combine this with a quiet house and it is almost like being in a sensory deprivation tank or a warm cave. No aches, no tiredness, no distractions. My body relaxes leaving my mind free to go wherever it wants. Different to drumming, but no less effective! The first time I tried it I was helped by a steady drip which was almost like a slightly slow drum beat, which made the transition into another way of working easier, but mostly all is quiet. Once building work resumed, sadly the magic was gradually eroded away as more and more light seeped in from around the edges. Then last week we had the excitement of the window being finally fitted, opening up the space to daylight and views across fields, which for most times of the day is a huge improvement! Yet while I love the effect on our hallway (which has no windows of its own), and getting a blast of curtain-free daylight in the mornings, already I have needed to create a quick, temporary, darkening solution using a remnant of blackout fabric, three eyelets and three screws, to last until the plastering is done and I can make or fit a proper blind. In full light, the unfinished bathroom becomes just a mundane space, too bright and distracting to travel in. With the cloth in place, while not the total blackout I had previously, I can switch off to the world around me. I never imagined darkness would be something I would grow to love so much that I don’t want to lose it! Candles have apparently formed a part of ceremony and ritual for around 5000 years. A ritual without a candle (or a fire) burning, no matter what other offerings or symbols are on an altar or equivalent, to me is just a meditation. It might be very meaningful in itself, but there is no uplift. No Fire in its pure elemental form to create a transformation in my subconscious. So having finally established that there are suitable candles for me to buy, I then start considering candle holders. Not many are this small, and they will need to be sized fairly specifically to which candles I choose to buy. Sticking one in melted wax on a plate is basic but tempting! But there is also the question of how many candles to have, given candle holders often come in pairs. At this point I spent some time in meditation. I asked, what does my ideal altar look like for use indoors? Two candles at the back. That was a surprise because it isn’t what I usually do. They are equal, yet apart. Goddess and God, Mother Earth and Father Sky, female and male, dark and light, above and below, within and without, manifested and unmanifested. I realised we live in a world of duality and what I seek is balance. Then on the right side of my altar, an apple Wand (I wonder why apple? I’ll come back to this when I know… ), ready to pick up and use, while on the left, a silver (pewter) cup bearing water. In the centre at the front, my working area where I can place anything specific to that ritual, ideally on a pentagram disk of some kind, completing the five-pointed arrangement. Underneath is my portable table covered by a bright green cotton cloth. Behind on the wall is a beautiful fabric picture of a tree. I share this because it is considerably more basic and simple than most witches use – and in fact than I normally use! Yet although I was then shown how it could be added to, the athame next to the wand, a bowl for salt next to the cup, Goddess and God statues behind the two candles, other items specific to the ritual such as gemstones, flowers, amulets, pictures, carvings etc, I realised it is perfection in its simplicity, with each item being hand made and beautiful in itself. Both male and female are present, as are all four elements, as is an ancestor connection. If my altar represents me in the higher planes, then I seem to be calm, peaceful, simple and uncluttered inside. A permanent altar with lots of things on it is not something that feels right to me because I live with non-Pagans who would have no use for such a thing and not treat my tools as sacred; when I am not using them, they (bell, athame, swan feather, cups, offering plates, etc) are safe inside my desk, along with all the other sacred objects, talismans, divination aids, space clearing tools etc that I possess. Our ‘seasonal displays’ on the mantleshelf act as a permanent focus with the various quilt tops I have made changing for each sabbat – they are based around the pagan year, which is of course the solar year so easily understood by all including visitors to the house. Our two dining candles live there when not in use, creating a parallel with my altar. I also have various locations in the house where there are power items that are left out all the time, and a place where I leave offerings in the garden. So after a bit of thought and experimentation, I find a really simple altar inside gives me the freedom to set it up quickly and easily when I want it (and dismantle it again before collecting M from school), and I have the flexibility to add any statues or symbols or flowers etc that are befitting to the ritual. The loss of some tools does, however, feel like I am breaking a lot of rules! I clear space before casting a circle, so these tools are kept nearby, but I won’t now be putting them on my alter after use. My wooden athame I made has not seen much use, and it was interesting while exploring altars and candles to read other people’s comments that they don’t use an athame outside for fear of upsetting elementals – any blade is objectionable, not just an iron one. (I wondered if some witches used knives originally so that they had one to hand in case protection is needed. Also I suspect only rich witches in times past would have had a spare knife for magical purposes! Another area to come back to…) Incense I don’t use because I can’t cope with smoke – but I do sometimes use natural sprays while cleansing the space so I’ll have to find a way to work these in. Also my apple wand will need consecrating when I have made it, so I’ll have to find a way of doing this that doesn’t involve smoke! I am amused that I started out just trying to work out what candles to buy, and have ended up redesigning my altar, and probably the whole way I celebrate. Sometimes all it takes is a small thing for us to make the big changes that we simply couldn’t see before. There are grass verges in front of most houses at the outskirts of our village, a legacy of Edwardian planning, setting the houses back from the road. Most of the verges are neat, mown regularly by the council, though occasionally covered in wheel tracks or removed altogether where space is needed for parking. Ours currently is not neat or tidy. Ours is completely covered in little brown molehills, where a small, black creature has evidently been digging in circles. When I started this blog, I asked which animals would like to help me and offer their support. The result is the sketch I made at the top of the page. One of these animals was the mole, who made himself known to me in the same way as he is now, by making molehills all over the place. And then disappeared as silently and completely as he had appeared. So now he is back, I felt he had a message for me. Unfortunately with the holidays my meditation time was massively reduced, my focus has been elsewhere, and I never made the time to simply ask Mole what he had to say. Instead I spent three weeks being puzzled. Not annoyed with the destruction of the otherwise perfect lawn – it is winter and no one is harmed by a few molehills, but it is so extreme as to be very odd. And then suddenly the penny dropped. 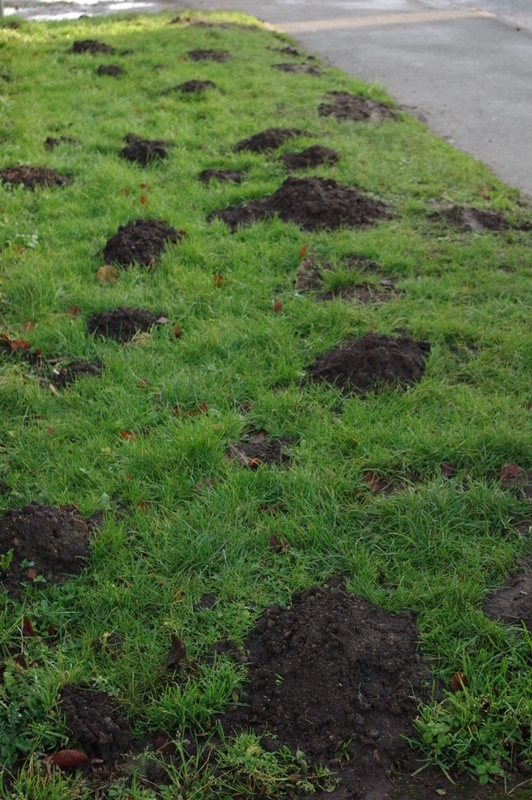 Molehills on the grass verge. I have been working with the elements individually, something I do every so often in a cyclical way, deepening my connections each time, and this time started with Earth knowing I find that element hardest. It is also the element of the North, and of Winter. 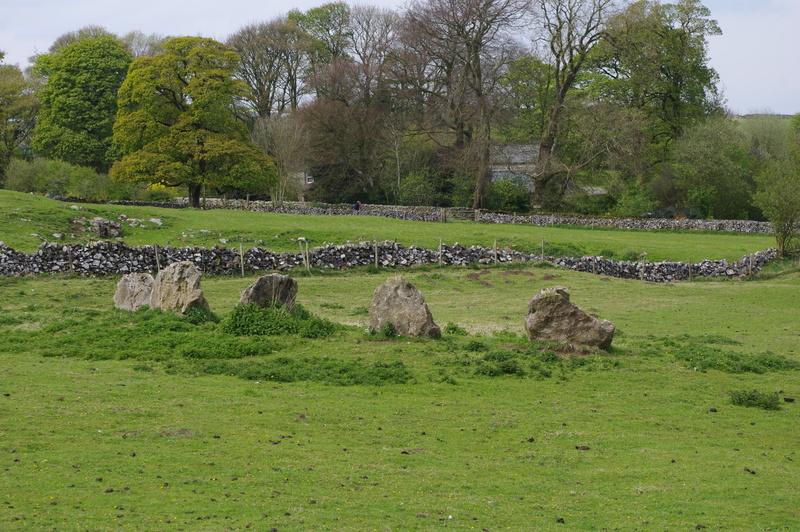 A good time of year for working with rocks, crystals and other gemstones indoors, and going for (short) walks on Derbyshire gritstone, but not for gardening and connecting directly to soil with my hands. The ground in my garden has alternated between frozen or waterlogged for the past three weeks and certainly wouldn’t be helped by digging or compacting right now. But then I looked again at the molehills. Perfect soil, not frozen, not waterlogged, already loosened for me. Created by an animal of the Earth. So obvious in retrospect. My original intention had been to try meditating with some soil indoors, just as I had done with different types of rock – one from my pond, another I brought back from Wales last summer, etc. Soil is after all the basis for trees, which I have never had a problem connecting with! But when I got outside I realised I had already done all the indoor work I needed to, exploring loam, sand, silt, clay etc. and how they relate to different types of trees growing, and if I did any more was in danger of becoming so Earthed that all would reach a standstill. I needed to be active, practical. So instead I had a really enjoyable time raking all the little heaps level, seeing the various qualities and ingredients in the soil that help plants to grow and moles to feed, and marveling at how much the soil can vary in colour and texture even over quite a small area. Not only that, but I managed to do it in the only hour of sunshine for about three days. A really lovely working meditation. So thank you mole, and I expect it is goodbye again for now. Janus looks both ways, forwards and backwards, reminding me that both matter. So as the new year begins, I am reflecting back on how much is different to what I had imagined. I have written already about my tendon injury. While it continues to heal, I have changed. I am no longer dreaming of all the physical things I hope to achieve; instead I am grateful for each thing or outdoor experience that does happen. Possibly this is self-defence, in that I don’t want to get my hopes up again. Yet I have found an inner peace and happiness in just being. I no longer feel there is always more I could or should be doing. My rhythms are constantly changing, dictated to me by outside forces. A year ago I promised to meditate more; had I not managed this I would be lost. Yet within that there are times when I have plenty of meditation space, and other days or weeks that feel crowded by activity. Somehow everything gets done, even if never in the way I plan it. Writing is something I have long dreamed of spending more time doing, and yet when I had three weeks of enforced hip rest and no interruptions I quickly ran out of things to say. Staring at a blank page of fiction suddenly felt self-indulgent and I realised my family needed me. I no longer need to prove to myself that I am ‘somebody’ because I write; I have a job as a homemaker, decorator, gardener, seamstress, cook, mother, lover … and am loved and valued for it. Even my blog has taken second place at times – if I didn’t have something to say that fits the very broad definition of either pagan or crafting, then I decided to ease up on myself. Once or twice a month is sometimes what I can manage, if I am concentrating on other things. Looking back, there are two things that have changed me. One was realising my happiness depended on what stories I told myself. I had the power to be happy or not in any situation, depending on how I interpreted it for my conscious self. 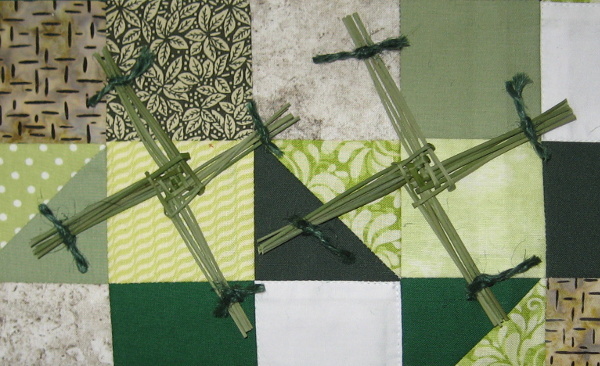 (See my comments about happiness under Samhain Quilt in October 2017.) The second was some recent journeying experiences of being some kind of woodland elf. Most people have had past lives, to which windows are sometimes opened, usually revealing a previous human existence or series of existences. Mine, so far, are not. They are of living as an advanced elemental in freshwater, or in woodland, the two environments I am most at home in, that give healing to me just by being there. (Unlike the ‘seaside / blue skies’ pictures or holiday places generally recommended to get healing and calm.) I do not fully understand these memories / experiences yet so haven’t written much about them (the first was 2-3 years ago, most were 2-3 months ago), but I am wondering if this life I am now in is about learning to be a human being. 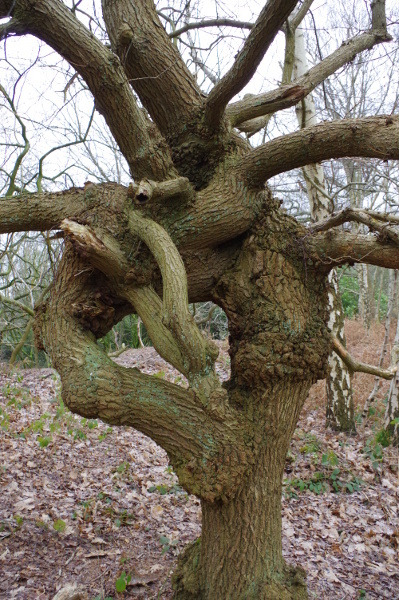 I often feel myself in this life as a hazel tree going off in all directions with no strong central trunk, but all weaving together to build a strong support. I would often prefer to be single minded, an expert at something, yet this is never the way things work out and it doesn’t seem to matter. Believing what I now do it makes some kind of sense and also deepens my love and respect for the Great Spirit that is in everything and knows all. So looking forwards, I have no plans, and no strong desires. I will simply trust that everything comes in its own time, and that there is more to come. If there is one challenge to set myself this year, it is to love more, to see the good in everyone and every situation, even when I am not feeling calm inside. In other words, be a good human being. 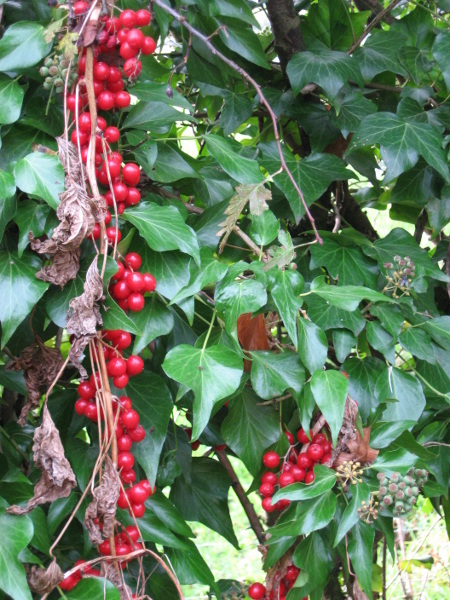 Black Bryony berries garlanding its way through the ivy. 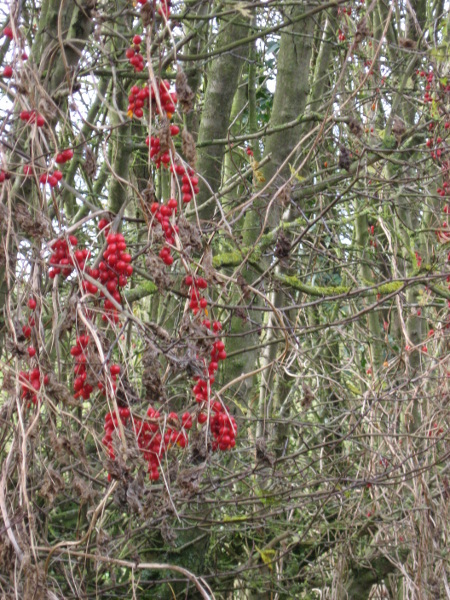 All autumn I have been enjoying the sight of black bryony berries garlanding the hedgerows. They are of course a fairly common plant in most of England, but one I only tend to see once the bright red berries have ripened. The flowers are fairly small and insignificant. 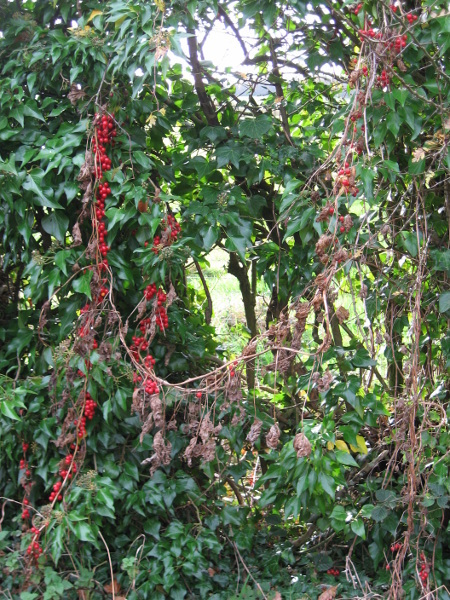 Black Bryony in Hawthorn hedge. 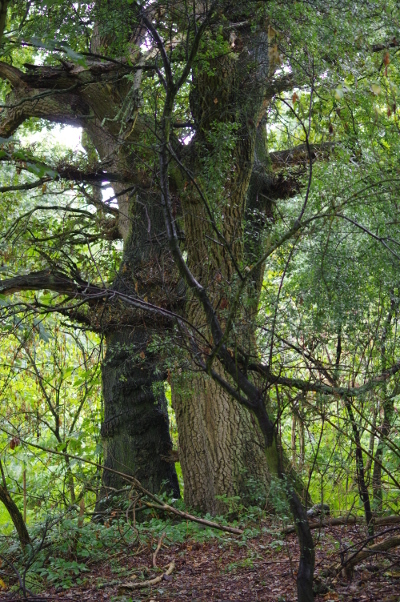 There are two bryonies, named white and black after the colour of their roots, both looking very similar for most of the year since they each have mid-green ivy-like leaves, small insignificant greenish white male and female flowers followed by red berries, and they climb up hawthorn with abandon. However they are completely unrelated to each other. White bryony, Bryonia dioica, is a member of the curcurbitae family (ie courgettes and melons) so climbs with tendrils, and is dioecious, while Black Bryony, Tamus communis, belongs to the Dioscoreaceae family (ie yams), climbs by twining, and is monoecious. Both are poisonous in all parts. Black Bryony berries and ivy. Black bryony berries and juice or pulp from the root have been applied directly to the skin for bruises, strains, gout, rheumatism and hair loss because the calcium oxalate it contains as crystals irritate (or stimulate?) the skin. It has also been used to cause vomiting in careful doses, and when mixed with wine or honey, black bryony has been used for gravel or asthma. An overdose is likely to cause a painful death however. All parts also contain saponins, another poison, although one which is normally deactivated by cooking – but the young shoots are cooked and eaten like asparagus in southern France, Spain, Portugal, Italy, Croatia and Greece. I managed to meet Black Bryony in meditation, and found a very interesting energy which was willing to communicate with me, appearing briefly in a dark female form and very beautiful. Its element is fire, and its focus is transformation – hence is medical uses. But transformation can be destructive to some if they are not willing to change, to let some parts die down. It was used in alchemy for this purpose. [I cannot find any evidence for this as yet, although I’m not an alchemist so it may turn up…] It has been particularly active along the lane to create the transformation that I have seen this year. It has developed strong roots in the course of this work so will continue to grow well there, but doesn’t need to spread further. It also brings harmony, creating links between species. It does not help the fiery aspects of will, or of strong focus and intention. 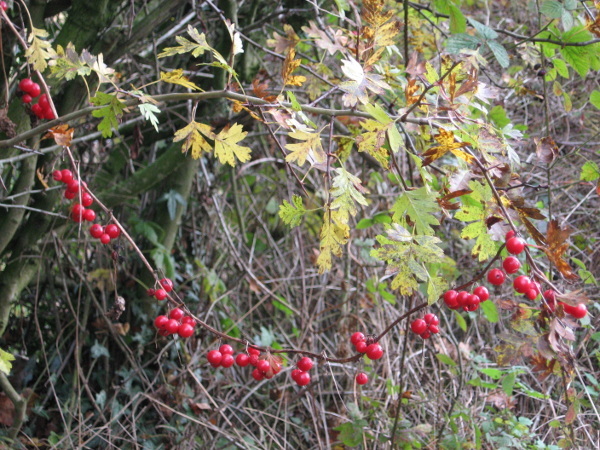 Black Bryony makes a garland under a hawthorn branch. I was lucky enough to be camping in woodland for a week last week, in an area hitherto unfamiliar to me, the Forest of Dean. Unlike that other ancient hunting forest, the New Forest which has more moorland than woodland, here trees go on for miles: an amazing expanse of green. The type of trees vary, but where we were camping (near Symonds Yat) it was mainly beech with some oaks and occasional yews, plus rare native whitebeams and small-leaved lime trees around the edges by the cliffs. One evening towards the end of the week I went for a walk by myself, and having not been there yet, set off in search of the nearby hill fort. 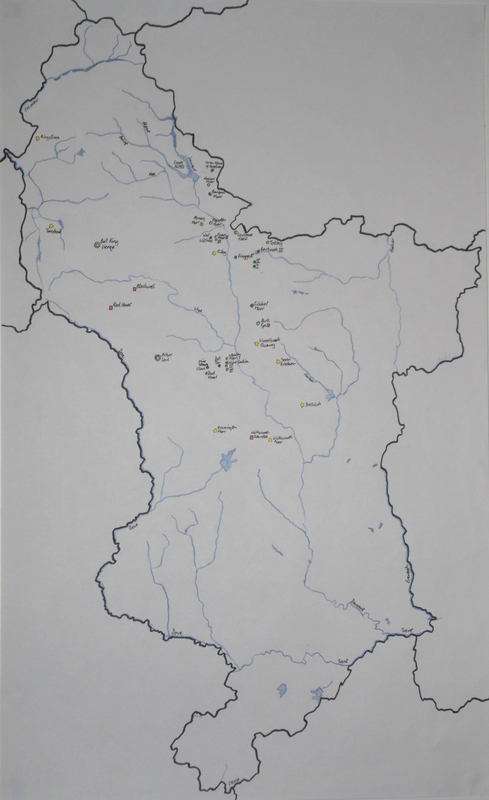 There were no direct paths shown on the map from where I was to the fort, but this is a woodland which seems to generate many paths of which only a few are planned and plotted. 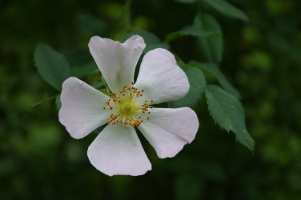 I started out well, past a disused quarry where I found dog roses flowering, and then briefly explored some caves. A choice in the paths, I headed deeper into the woodland and then along in the general direction of the fort. Another choice, I chose woodland. I regretted this fairly soon as the path veered off downhill towards the river Wye, so I took the next available turning back uphill again. 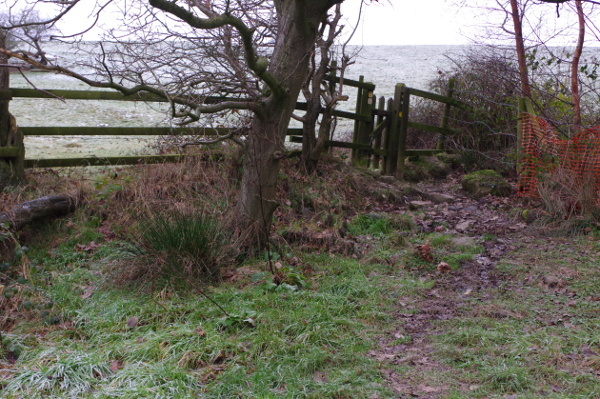 This path continued for a distance, until I met with a wall and a gate that was too blocked with fallen leaves to open. Jumping over I met with a track only a short distance away, going in roughly the right direction; I kept an eye on the compass and also the time. It went well for a short distance, even being built up over a rocky section to leave a smooth path. 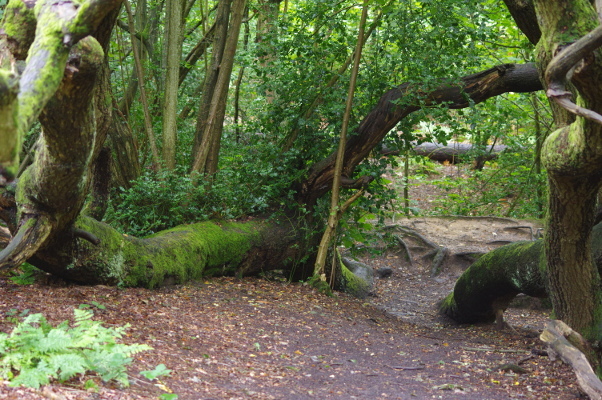 Then a couple of fallen and now dead beech trees blocked my way. The track continued under the first, so I climbed my way through. Then it petered out to nothing. I headed up the steep bank, picking my way carefully and wishing I had hiking boots on instead of trainers. I kept expecting to come to another path, but it seemed some time before I eventually hit on a higher track. Having few landmarks and no clear view since crossing the wall, I managed to follow this the wrong way for a short distance. Realising my mistake, I turned around and discovered where the track turned in the right direction a short distance back from where I had joined it. Further along there was a style over the wall that I had crossed earlier (no the wall wasn’t straight), so I took note of it for my return. 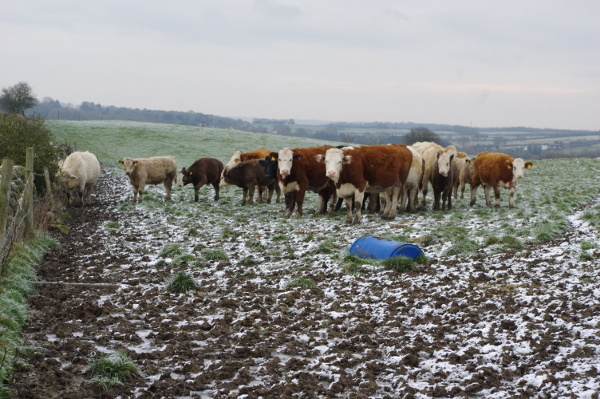 After another turn, the track led me to open space at the top of the hill, where longhorn cattle were grazing, and there, finally, lay the hill fort before me. I was out of time, so I went no further that evening. Instead I followed the other path option I had seen, and returned to the caves in half the time of my outward journey. Pretty, but no drama. We used this path the next day to all explore the hill fort, where we found wild strawberries just ripening. It occurred to me that had I taken the direct path the first time time, I would have had a very different walk and experience. I had expected to have trouble finding the hill fort; as a result I hadn’t looked for an easy route and therefore my expectations were met. It was tricky to find the right hill going my way! It was also thoroughly enjoyable and adventurous and fun! I had a proper woodland experience, connecting with what was around me. I saw a boar, deer, heard foxes, not to mention rabbits and squirrels, plus all the birds from buzzards to robins just on that one walk. Not only that, but on my return journey I fell in with a local who showed me some of the more hidden delights of the area – which I was able to share with my family the next day. 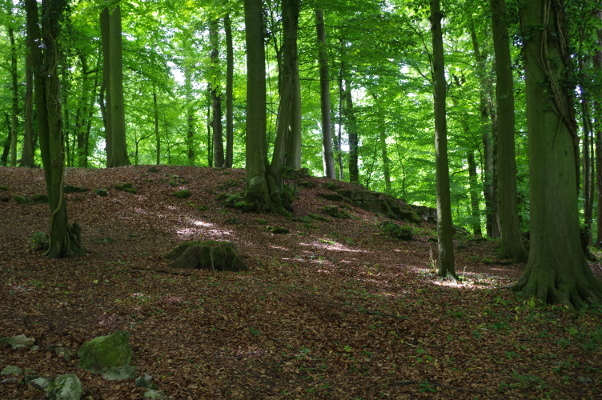 Beech woodland, with edge of rock spiral in the corner. 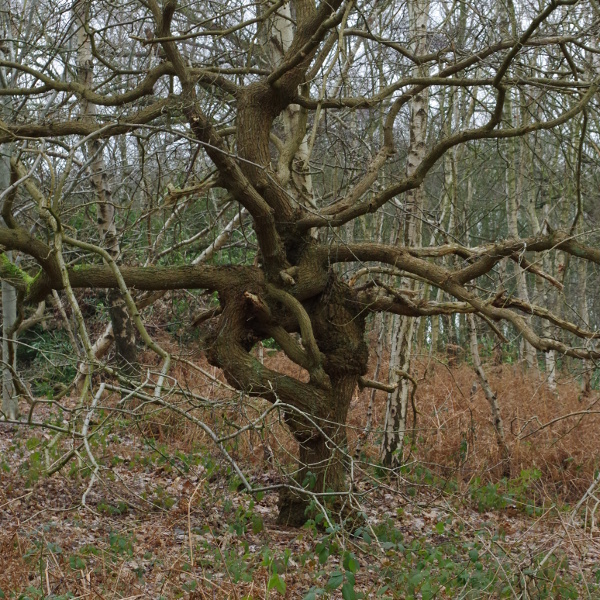 While I am writing about my woodland experiences, I also had an interesting experience with a tree on my last day. It was while walking a rock spiral someone had made – I reached the centre, looked up, and my eyes immediately fell on this tree in the picture. It seemed to be watching me and being amused, yet at the same time friendly and open to conversation. I felt welcome in the woods. Friendly beech tree watching me. However, the lesson I received when I meditated on this later was quite different. 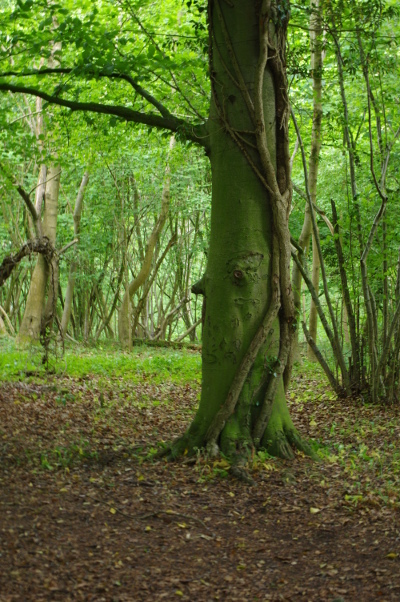 My notes read as follows: “Beech tree I was drawn to – an individual, standing by itself with its own character, despite being one of many in the forest. Similar but not identical, I would know it again. I could have been drawn to the group of 6/7 all growing so close they were almost as one, but I wasn’t. I didn’t even photograph them – light is an excuse and could have been overcome had I felt the need, [they were rather dark!] it was the individual I noticed, and that says something about me, and how I feel about myself, how I want to be. Unique, maybe even a character.” That’s told me then! Last weekend I had an unusual opportunity to have a longer walk than normal, by myself. Nowhere particularly exciting – I could choose a drop-off point somewhere along the route the rest of my family were going to be driving, and then I could walk home from there, but this had the advantage that some of the walk would be on unfamiliar footpaths. Total distance around 6-7 miles, with about 3 hours before I needed to be home. 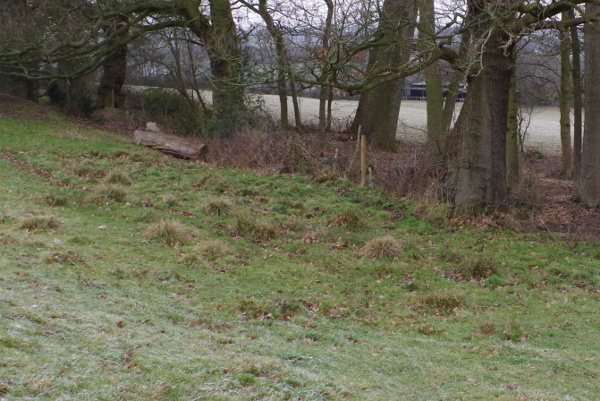 The first part of the walk was through a country estate (lots of those still in Derbyshire!) 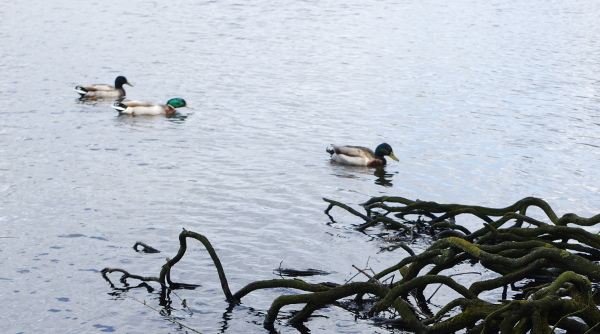 with a lake that turned out to be a popular place to feed the ducks. I had hoped to stop somewhere around here and meditate, but it didn’t feel like the right place to stop, and there was a very cold wind blowing. I just took a few photographs instead. The walk continued to be pleasant through the park with various non-native 200 year old trees dotted about, and then into farmland. A brief visit to a small village and out again along a very pretty stream. Still nowhere to stop, and various chatty dog-walkers about. After that I took a ‘wrong’ turn, not following my original plan. I realised my mistake almost immediately, but it looked inviting so I decided to continue across an old railway line that is now a footpath although not shown on my map. It seemed to mark a boundary, as from that point on I met no other walkers all the way home. I had sadly left the prettiest bit of the walk behind me, but also the populated areas and the people. I found a sunny, sheltered patch of grass next to a farm track to sit on and have a bite to eat, and then continued walking as it wasn’t somewhere I wanted to linger. Finally I realised I wasn’t going to find my perfect meditation spot anywhere. 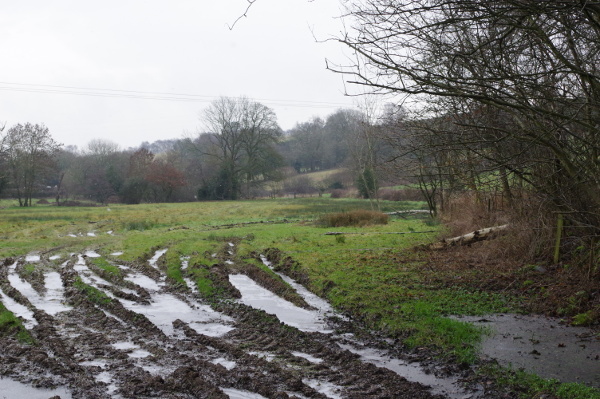 I was still 3-4 miles from home, knew most of the paths, and they didn’t go through any woodland or watery places or pretty spots or drama; it was just fields with the occasional bit of road to cross. I wondered if I could do my meditation while walking. I let myself go into Alpha state, dulling the sensations of the world around me and opening to my inner world. My question was simple: having been reading about guardian angels, and the fact that angels are spirit so can take different appearances as needed, were the other spirit friends I meet with regularly simply my angel choosing that form to help me, or was an angel different? First I met with one of my dragon spirit friends. Then he helped me meet my guardian angel. I could feel the energy as completely different. There was no way I could ever confuse the two. I thanked dragon, and then talked with my angel for the first time. Staying in alpha, we walked together, and I felt my angel’s loving presence, knew it would be there for me no matter what. Other guides are just that – guides, or teachers, or advisors, but I understood how the angel was a guardian, just there for me, whether I asked it to be or not, and would always be there. Most of the time we just walked in silence together. Finally as I entered my village and was almost home, I said thank you and left alpha state. My inner world closed, and the physical reality around me was once again my reality. But I was somehow changed. Filled with love, with light, a feeling of lightness, and connectedness. I had a sense of who I was, as Spirit but with an extra dimension to previous spiritual experiences. I didn’t post this last weekend as I wanted more time to process what I had experienced, and also because new questions arose in my mind and I wanted to see what would happen next. A few days later I was again walking by myself, this time just a short distance late in the evening as it was getting dark. So I tried contacting my angel again, this time by myself. I knew it was there, but I was not on the right wavelength to have any meaningful conversation. I returned to the spirits I knew, and felt immediately among friends. I then understood them to be octaves apart in terms of vibration, and I was clearly more comfortable at one level than the other. It may also be that the first time I asked for help with a particular issue in which a higher level of love and trust was needed to dissolve a fear, so the angel was best placed to help me with this. I didn’t have this same need the second time, and the playful company of dragons was perfect. It is now my understanding that Angels will always give help when asked, and unconditional love, but they are not beings for ‘just hanging out with’ as I often do with other spirit friends. (Dragons or other animals.) Anyway I decided I would share this in case it interests others and helps anyone else on their own path. Happy New Year … Again! We have finally reached the last of the ‘New Years’ for the winter – the one generally celebrated across the country! As a pagan I normally like to work with the rhythms of nature rather than an arbitrary date, so have celebrated a new year’s cycle beginning at the start of the dark at the Autumnal Equinox, the general Pagan new year at Samhain, and the return of the light at the Winter Solstice. And yet besides being the day we turn all the calendars over, 1st January probably has one of the strongest rituals I can think of associated with it as people who share the Gregorian Calendar all around the world make resolutions for the year ahead. To be part of a collective humanity is valuable – just like any shared activity, or shared and repeated ritual, the more often it is repeated the more the power within it can grow and be used positively. The only reason for making new resolutions or promises that I can see is to shine a light onto my path ahead and see what I need to do or what choices I need to make about my direction. Last January I had a list of various specific things I wanted to achieve – sewing projects, glass, swimming, drumming etc – most of which has been written about here over the course of the year. It was helpful in focusing my mind when I was struggling to see what was important to me independently of the rest of my family. I will take more time for meditation – to include attuning myself to what I am doing, just being, and learning to stay calm. The first time I read this I laughed, assuming either he was making a joke, or he was saying that we needed to cut back on some of what was filling the time up, that we were overdoing it. However as I looked at what changes I wanted to make in my life, I have seen that meditation is related in some way to all of them. The first is simple. If I am too busy to meditate, I won’t get any answers from within and therefore will not move forwards – besides not reaching the still point of Just Being that is so valuable and only seem to comes when I have dealt with any pressing issues. I am finding that out of stillness arises creation. After dwelling on this quote a little longer however, I started to see the idea of being busy and needing longer to meditate differently. There are always going to be more things I want or need to do than I can fit, because that is the way I am. If I don’t seem to be managing to do everything, meditating seems to help me focus on what is important and how to do it easier, and which things maybe I can leave out. A daily set time and place is difficult for me as it gets squeezed out too often, but when I don’t manage my ‘regular’ slot I need to make another space. The second part is to make a more conscious effort to meditate in different places – attuning myself to the environment through meditation, either to make a connection with the environment, or as part of whatever work or craft I am doing. Outside before I begin gardening for example, if I am serious about wanting to work with the nature spirits in the garden. When working with glass to literally work with glass and be part of it, or with wood, or with anything else I wish to craft, such as I just discovered with the origami dragon and its bigger brother from red shiny wrapping paper that is now nestled in the tree. The whole process of creation changes and becomes bigger than just me. Finally the third and fourth parts are related, as I have learned to ‘just be’ in some circumstances and not others. I know, this could take a lifetime or more to master! In the short term however, am hoping improved meditation can help me stay calm even when provoked, or that I can see alternative ways of handling difficult situations. Anger or frustration I see as emotions intended to force or inspire change so not negative in themselves, but they need channeling and directing and that, for me, starts with meditation. Or at least it will this year. It has also been a very interesting experience having committed to writing weekly, as the writing itself has almost become a meditation exercise. While some weeks it has been clear to me exactly what I want to talk about, other times I have got to Saturday evening or even Sunday morning and still have no idea. However, in every case these have been the posts I personally have learned the most from because there always seems to be some subject hovering around the edges of my consciousness that needs bringing into the open and properly examining instead of shying away from. They are not always the stories that make me look good, and sometimes I have had to think quite hard about whether or how to share. Admittedly a few end up in my ‘unpublished blogs’ file, but the writing of them was still a valuable experience which wouldn’t have happened otherwise. I have learned an awful lot in this way, and I hope that by sharing more of my own stories other people have also found them helpful. Even this one – which has strayed a very long way from my original list I started a week ago! I used to hope I could find somewhere to park. I was often disappointed. Then I tried trusting that I would find somewhere to park, which usually worked although I might have to walk further than I wanted to at times. And it might be on a curve, or a tight fit for getting a pushchair out of the boot. But now I have a better way. I simply ask for a space. To do this I access the same state of mind I use when dowsing, a sort of light-meditation, functional but not interfering in any way with my awareness of my surroundings. Given I am usually driving at the time this can be important! (So too can be choosing a quiet moment.) Then I frame my request something like: “An it harm none, please find me a suitable parking space. As is my will, so mote it be. Thank you.” The first part allows Spirit to make the best possible choice for everyone, while leaving my request unspecific. Adding the second sentence, and the gratitude in advance, I know it will happen – I can then let go and see what unfolds. What has been interesting to me is the range of parking spaces that have become available to me using this method. Places I might not ordinarily have thought of parking but where one car has shown me a new option at right angles to the road in a natural layby, or by a disused lot. I have also found that all spaces have been really easy to get in and out of, a rare thing given my previous experiences, and have been on the right side of the road for getting M in and out of her seat. Once I even parked a hundred yards from where I normally do, so used a different footpath to join the river path, and then found my normal footpath was temporarily closed off. So I am now left wondering does this work because I have invested greater trust in finding a space, taken out any specifics of what I think I need, and am therefore open to seeing the unexpected; or because I have accepted my spiritual nature and asked for help, thus opening new opportunities? Just as I like to tidy a room every few years and clear out what has become ‘clutter’, I have spent the last week going through my computer files. It is amazing how many folders remain untouched since the last clearout, that may as well be moved into ‘Archive’. A few thousand emails have been deleted, while a handful of wonderful ones have now been stored in appropriate folders to make me smile again at some point in the future. Photos of nieces and nephews remind me of when they were small. Good wishes or news from friends who live overseas. Memories and video clips of canoeing trips. There are other, more pagan- or possibly witch-specific uses for physical photographs as well. While I am not a great one for spells, especially those involving living people, using photos for connecting to recently deceased ancestors is much simpler than trying to get hold of relevant objects to represent them. I have had a frame for some time now waiting for pictures to be printed out and inserted so that it may stand on a side table. It seems to me that human nature hasn’t changed much; for thousands of years we have painted our memories, first directly onto our walls, then on wood, leather, canvases or parchment. We may puzzle at the exact meaning today, but we still value the pictures. However just as we have hidden files in silicon crystal that may be accessed in the future, so did the ancients, in the form of quartz crystals. Meditating with a stone, or even a skull, can reveal all kinds of truths and memories that have been stored there.